The Garnì Garten is a small family-run hotel located within the Hotel Rosen Garden area, with which it shares the garden, swimming pool, private beach, restaurant and other services. Pets Allowed. The property is located a few steps from the sea and a two minute walk from the center of Milano Marittima. 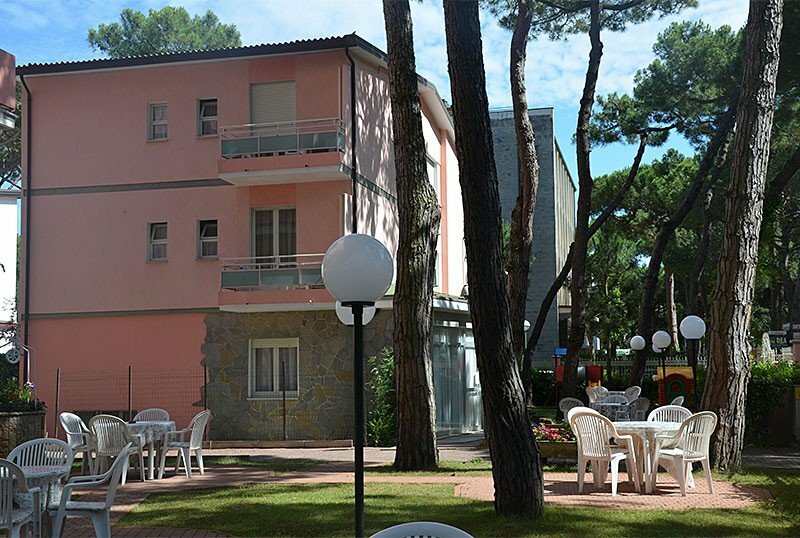 The rooms of the Garnì Garten are comfortable, all equipped with satellite TV and digital terrestrial, WI-FI, safe, independent air conditioning and private bathroom with shower. Hairdryer on request. FAMILIES: connecting rooms are available. Large garden with heated pool, bikes available, beach towel, theme nights, Sunday aperitif, TV room, reading room with newspapers in consultation. Paid laundry and transfer service to airport and station only for stays of 7 days. WI-FI: both in the rooms and in the common areas. AIR CONDITIONING: both in the rooms and in the common areas. CONVENTIONS: amusement parks. Shuttle service for a fee. PETS: small pets allowed with the payment of a supplement for room sanitation. BREAKFAST: international, buffet, with homemade desserts and organic products. LUNCH AND DINNER: choice of menu every day, meat and fish dishes, buffet of appetizers, side dishes and desserts. Water and wine with meals. OTHER: Sunday aperitif and Romagna dinner once a week. In hotel: outdoor and indoor playground area, swimming pool, strollers. Paid: baby sitter and pediatrician. At meals: high chairs, dedicated menu, flexible hours, afternoon snack. Large swimming pool at different heights for adults and children, hydromassage, garden and solarium with sunbeds and beach umbrella. Guests can enjoy a parasol and two sun loungers per room booked (minimum 3 days, day of departure excluded) in the private beach, bar, games and many other services. The list prices are per person per day in All Inclusive for a minimum stay of 3 nights. Free for a child up to 10 years if in a room with at least two adults and for a minimum stay of 5 days. For older children, discounts from 20% to 80% throughout the season. Free for a child up to 6 years in a room with at least two adults and for a minimum stay of 5 days. Easter and first sun at the Garnì Garten in Milano Marittima. Take a break from work and come to the Garnì Garten in Milano Marittima. First sun at the Garnì Garten in Milano Marittima. Special offer for the couple at the Garnì Garten in Milano Marittima: 7 days in all inclusive, € 475.00 per person.